After Sunday night's VMAs aired, didn't you just feel a weight lift off your chest? There were rumors for weeks that Beyoncé and Jay Z were headed for divorce, but when they kissed on TV with Blue Ivy right there, that settled everything, right? Well, not exactly. Okay, not at all, and this is why a body language expert decided to analyze a photo (below) of Beyoncé, Jay Z, and Blue Ivy at the VMAs. And what do ya know, they aren't actually a happy family! According to body language expert Susan Constantine who spoke with the New York Post, "I see a lot of hurt and pain here. They’re just trying to save face. They feel no emotions toward each other." Now I'm no body language expert, but Constantine's evaluation sounded pretty reasonable for the most part. Of Beyoncé she said: "She’s giving a false smile" and explained that Beyoncé's hip being angled away from her husband is a bad sign. Of Jay Z: "This is what we call a flat face. There’s no expression whatsoever." But then we got to Blue Ivy, and all credibility (for me, at least) was thrown out the window. 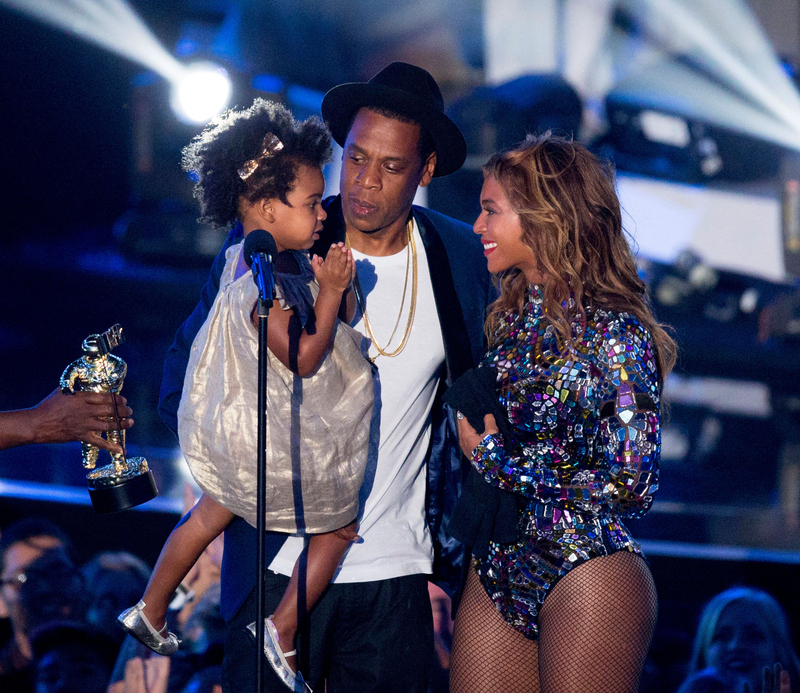 As you can see, in the photo Blue Ivy's hands are clasped together. Constantine said of this, "Maybe she’s praying her parents get back together." Come on! I could've come up with that! This made me realize, that perhaps reading body language is like writing a horoscope — as long as things could make sense, they're fair game. (My apologies to astrology and body language–reading lovers. These opinions are all my own.) For this reason, I've decided to analyze the photo myself because I see something different. Beyoncé's smile looks uncomfortable because she is attempting to look normal and calm for her daughter while also being concerned about her daughter being onstage in front of a ton of screaming fans. The fact that she doesn't have on a perfect Sasha Fierce grin shows that she's being herself, and is a bit self-conscious in this moment. It's not like she doesn't know about the split rumors, after all. Her hips are angled away from Jay Z because she's facing the microphone. Duh. Like Beyoncé, Jay Z is concerned for his daughter's well-being and knows that being onstage could be scary for her. Also, Blue Ivy is usually kept out of the public eye, so he probably knows that people are going to, I dunno, look at pictures of her and study her gestures for signs that her parents are getting a divorce. Blue Ivy is staring at her mother directly in the eyes because they are silently sharing secret Illuminati messages. Her hands are together because SHE WAS CLAPPING LIKE EVERYONE ELSE.